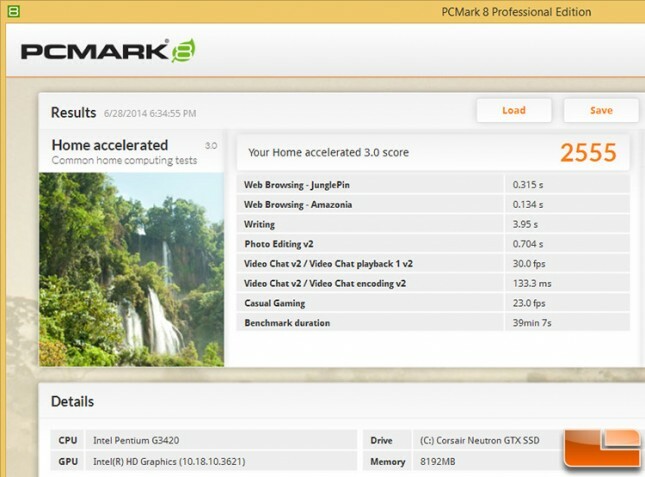 We ran the PCMark 8 Home benchmark, which includes workloads that reflect common tasks for a typical home user. These workloads have low computational requirements making PCMark 8 Home suitable for testing the performance of low-cost tablets, notebooks and desktops. Home includes workloads for web browsing, writing, gaming, photo editing, and video chat. The results are combined to give a PCMark 8 Home score for your system. Benchmark Results: The Intel Pentium G3258 processor was compared to the other processors we ran on the ASUS Z97-A motherboard and we were happy with the results. The overall score for the PCMark 8 Home Accelerated benchmark was 2555, which was about 25% lower than the Core i7-4770K. If you look at the detailed test results you’ll notice that web browsing scores are identical as are the 30 FPS video playback test. The only major differences here are on photo editing, video encoding and of course integrated graphics gaming.